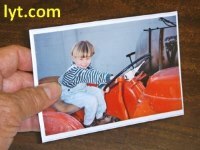 Cheap magnetic photo frames at reduced prices. Save up to 40% for a limited time on all 4" x 6" magnetic photo frames. Only $1.00 each in bulk. 4x6 Special Value Soft Pocket magnetic photo frames - Our best value clear front pocket style magnetic frame. Just slide in a photo and stick it on your fridge. The entire back of the frame is magnetic while the inside is white with a crystal clear photo friendly vinyl front. Contact us with your mailing address and request a free sample, US only, one per household please. 4x6 Crystal Light Hard Pocket - These are our best quality Hard Pocket style magnetic frames. Just slide in a photo and stick it on your fridge. Made with high quality crystal clear hardened vinyl on the front and back for brilliant colors and durability. Large magnet on the back allows the frame to easily stick to a steel surface. Lytle Magnetic Hard Pocket photo frames are available in all the stock photo sizes. 4x6 White Satin Soft Pocket - These are our original Soft Pocket style magnetic frames. Just slide in a photo and stick it on your fridge. Made with high quality crystal clear hardened vinyl on the front and soft flexible vinyl magnet on the back. Magnet covers the entire back to allow the frame to easily stick to a steel surface. Lytle Original Magnetic Soft Pocket photo frames are available in all the stock photo sizes or we can make these frames in any custom size. Contact us for more information, 724-352-3747. 4x6 Tuxedo Black Soft Pocket - Magnetic frame with a clear front and a black front facing inside surface that creates a thin black border around your photo. Made with a full magnet back and sealed on three sides like a pocket. Photo slides in and sticks to steel. 4x6 White Magnetic Soft Sleeve - Our inexpensive and high quality soft sleeve style magnetic picture frames are sealed along two sides and open at both ends for ease of insertion of photos. Mail the frame with your picture in a card or letter.